The picture above is of the BBC Blue Peter Green Book. 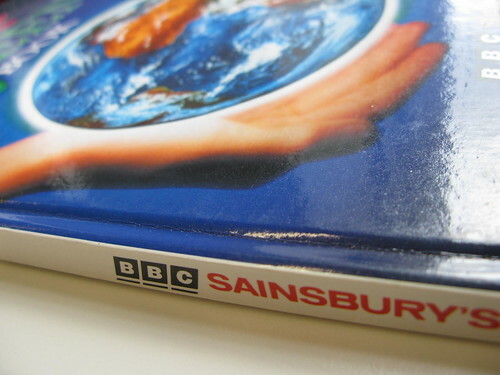 Published in 1990, following the introduction of a Blue Peter green badge in 1988. Sponsored by Sainsbury’s, it also has a forward by Lord Sainsbury, who went on to become science minister for the Labour Government. I have a copy of this book* which I have used when teaching children and the green movement, and dusted it off my bookshelf last week when I had an email from Leo Hickman at the Guardian asking me asking about the new Green Santa show from cITV (trailer here). Go read Hickman’s piece about this on the Guardian Environment blog, which uses the Green Santa programme to talk about the ‘volatile cocktail’ of combining children and climate change in some breadth. I’m quoted in the piece and added some notes in the comments thread, but thought it was collecting these thoughts here too. Hickman suggests Green Santa could be the first time children’s TV in the UK has explicitly constructed an entire series around the issue of anthropogenic global warming. Maybe. There is Captain Planet, but that’s American. I have some memory of a whole series of Nina and the Neurons on climate change issues last year (?) There’s also Uncle Jack from the early 1990s, but I can’t remember the details of (any?) science in this. Blue Peter‘s move to green issues in the late 1980s is worth noting, even if it was only a part of their content. 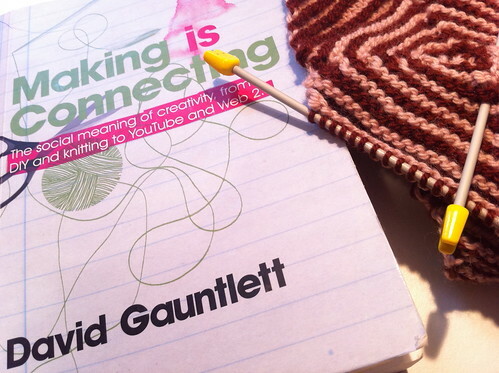 There really was a bit of a wave of this around the early ’90s (great book on the subject by David Gauntlett). Indeed, I wonder if the slightly ironic tone of the Green Santa trailer reflects the way in which a climate message has become a well-trodden ground in children’s media. It’s one of the ways I find Green Santa‘s tone very different from the more earnest Captain Planet (which because of the fictional element, we might otherwise compare it to). Chris Ryan’s Code Red series and Saci Lloyd’s Carbon Diaries as. These both start with protagonists bored by green stuff which is largely seen as a boring old worry of their parents and then, through their involvement in a new crisis, they can re-discover the issue for their own generation. I also wonder about the role of nostalgia here. I think EDF Energy’s “it’s not easy being green” advert (‘made entirely of recycled clips’) is really interesting, especially as the girl speaking in it must be at least 30 by now. Nostalgia has run through the green movement since its origins, but this is generally nostalgia for some sort of (imaginary?) pre-modern age before we starting polluting everything. Nostalgia for something that is quite explicitly modern (even ‘late modern’) such as advertising or earlier iterations of an organised green movement is slightly different. Re-prints of children’s green books from previous generations are also significant here (e.g. 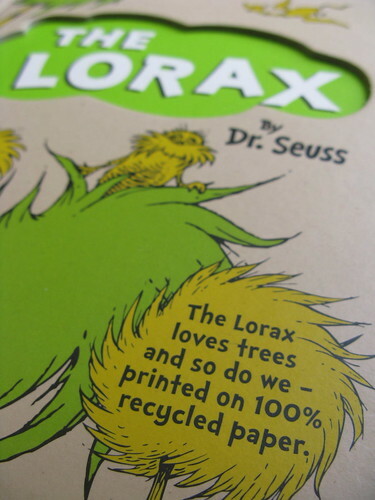 2009 version of the Lorax, below) suggesting a multi-generational culture at work here. A potentially key difference about the 21st century examples: I’ve read some media analysis from the 1990s cynically arguing that directing environmental campaigns at children is just a way of putting the issue off for another generation to deal with. Today, I think increasingly we see children targeted as a way to get adults to think about global warming. The Observer ran a magazine cover story last year on children pestering their parents on environmental issues. We might argue that the DECC’s Bedtime Stories campaign is indicative of this adults-via-kids approach too (albeit an allusion to kids, rather than aiming at kids directly). According to the DECC, this was based on research on how to appeal to adults (though we might ask questions about this). I’d love someone (me, given time and resources) to do some deeper research into this. The ethics, sociology and psychology of kids and climate change, including thinking about the role of children and childhood in adults’ lives. All fascinating stuff. * I don’t, however, have a Blue Peter badge, green or otherwise. Yes, this is something I’m slightly bitter about. This entry was posted in books, children, environmentalscience, guardian, television and tagged books, children, environmental science, guardian, television on December 6, 2010 by alice.